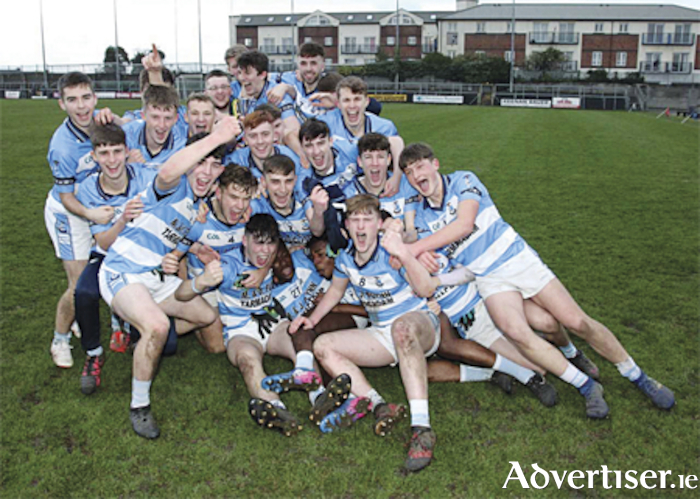 In what was a stirring and highly competitive final contest, with play moving from end to end at pace and score taking of the highest order, Athlone annexed the inaugural Westmeath U20 county championship with a tenacious and character laden display which saw them emerge victorious by the minimum over Castledaly/Rosemount in Cusack Park. The victors trailed by two points as the final entered the closing ten minutes but maintaining their poise managed to eke out the necessary points and claim a worthy win that ensured silverware returned to Pairc Chiarain on Sunday evening. Gaining initial scoreboard dominance, Athlone were soon reeled in by their opponents, with Sean Pettit in imperious form, and as half time loomed, the sole green flag of the game from Lorcan Daly, saw the vanquished enjoy a two point interval lead. Athlone responded with aplomb and levelled proceedings, but the amalgamation team were tireless in their efforts also and as the final ebbed towards a thrilling conclusion with the scoreline at parity, it was the left boot of Josh Beaumont who sealed success for Athlone much to the delight of the large blue and white support in attendance, who flooded the field post final whistle to acknowledge the efforts of both playing squad and management.